I'm having a bit of a hard time trying to type hiragana on Windowns. Japanese language is instaled and the IME option is on- I have actually been using it recently, but I must have pressed some key and now I get one hiragana symbol per key I press. If I type 'K', it will write 'の' whereas what I want is to type 'N' + 'O' to get 'の'. I guess this is the way some Japanese keyboards work, but I have no clue how to change it back to how it was! Can anybody help me this this, please? You need to choose romaji input, not kana input. How can I solidify my kana knowledge? Should we encourage answerers to include footnotes defining special symbols? 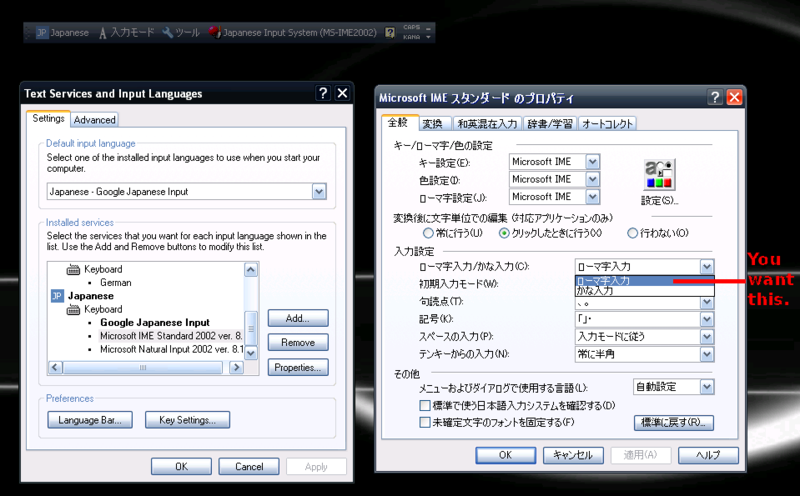 Any way to get English translations into the dictionaries Windows IME uses? Can I type デュ without using the small letter modifier?